THE building which became famous as Skeldale House in the BBC television series All Creatures Great and Small, has opened to the public for the first time. The instantly recognisable, stone-built Wensleydale building became known to viewers around the world as the location for the veterinary practice where character James Herriot worked. Until two years ago the property in Askrigg, North Yorkshire, was used by Broadacres Housing Association as a home for vulnerable adults. But now it has reopened as a luxury bed and breakfast. Read more about the transformation. 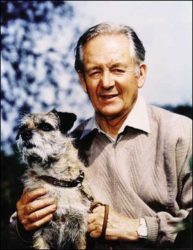 I would like to read the James Herriot books on my YouTube channel BeverleyVolfie. Presently I am reading The Laura Ingalls Wilder Novels. I Live in Canada are these books public domain so I can share them by reading them aloud? Hello! I am looking for the name of the pattern of the china set that was used in the series ….. there’s a really good pic in the episode “Charity Begins at Home”. Could you tell me the name of the pattern please? Thank you . I would like to buy the set for my home. Travelling from Australia I’ve visited all those iconic ACGandS sites in the Dales over period of 4 weeks covering 2 years (2014 & 2016). It’s every bit as captivating and beautiful as the series depicts. It was an incredibly romantic time for myself and my wife. We have also stayed in Skeldale House with Keith and Lisa the owners and can thoroughly reccommend it and the gorgeous town of Askrigg (Darrowby) to all readers. Does anyone know which book and chapter James Herriot describes staying for breakfast somewhere and being served a big piece of fat? I love all the characters, animals, the beautiful Dales, and the rich look at history the stories share. I hope you will tell me the name of the China dinnerware used at Skeldale. It is so sweet, elegant, and simple. I’ve searched around to find it, but no luck yet. I am usually very disappointed in movies that spring from books, but not so here! Brilliantly done. I must admit that I LOVE his BOOKS, I LOVE the video series, and that Christopher Timothy did a WONDERFUL job of reading the stories on audio cassette. (On sale at Amazon.com). Wow, I love them all. Imagine having just completed 4 years of college to become a teacher and in the last year reading the complete series (1980) and wondering if I could change my major one last time. My best friend is a large animal vet and his stories are as funny as Alf’s were. We both are nearing retirement and if we could have would have changed careers in a heartbeat. No worries though, Especially in times of stress I can sit down with one of his books and the worries go away. I among the millions of others appreciated what he did. I have known for a long time that the last four series of All Creatures Great and Small were based on original scripts, but I read in one book that some of the episodes from these later series were based on unpublished diaries that Alf Wight had lent to the BBC. I haven’t seen this information anywhere, is there any truth in it? For Mary Johnson- Chapter 39 All Things Bright and Beautiful, Aka Of Pugs, Pigs and Pickles in the series.